This post is sponsored by PetSmart® and the BlogPaws® Pet Influencer Network. but we only shares information we feel is relevant to our readers. PetSmart is not responsible for the content of this article. It's Spring time and it's getting warmer in LA. It was my first time going to a grooming salon so I was so excited! They had so many cool services to choose from! First of all, I wanted to feel clean and refreshed. Great for dogs who need just a bath to maintain a healthy-looking coat, clean ears and trimmed nails! Then I found out that they can made me a Top Dog! Then I chose Top Dog℠ SPAW with Coconut! It includes, Coconut shampoo and conditioner, Coconut spray, Balm & Nose cream, Nail grind & Teeth brushing and Paw massage! PetSmart Grooming is not only for hair cuts. I was kinda nervous because it was my first time being at the salon. But Chris wasn't nervous at all! All PetSmart salon associates acquire annual safety certification and take additional course-­work where they learn about dog anatomy, signs of stress and common pet medical conditions. Oh, then he made me this amazing Rainbow Chalking on my tail with PetExpressions! Chalking is a creative grooming service featuring color accents that are applied by hand. You can select one color or several colors to create a unique look. They have over 10 color options! You gotta check out hashtag #PetExpressions on social medias. They also have premium salon products like CHI for dogs. What a special day for me! He even gave me this cool bandana for Spring! Check out my before and after picture! So I went to a fancy outdoor mall to show it all off! Everybody was checking me out! Maybe because I'm so handsome or maybe it's thanks PetSmart Grooming?! My coat was so soft and shiny and I was smelling like coconut and sugar cookies. Chris told my mommy that I did really great and I was being such a good boy. There were so much Happiness at PetSmart Grooming Salon. 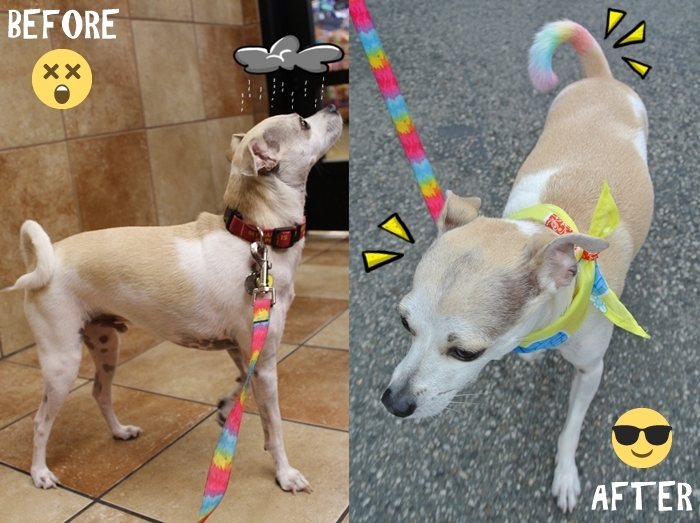 My rainbow tail is to give hope for my fellow dogs in shelters. Because after a storm, there will be a rainbow! PetSmart also have a PetSmart Charity! They are nonprofit animal welfare organizations that save the lives of homeless pets. But now I feel like a Top Dog of Beverly Hills. If you are a busy dog or pawrents, don't worry. PetSmart Grooming has Walk-in Services too! You can check out all the services on their website and book an appoint online too! This is a sponsored conversation written by me on behalf of PetSmart .